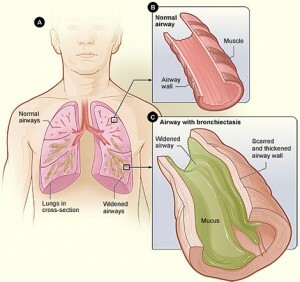 Find what is bronchiectasis, types of disease, anatomical changes and prevention and treatment. Bronchiectasis is a form of chronic obstructive pulmonary disease (COPD) in which the bronchi become widened and damaged. 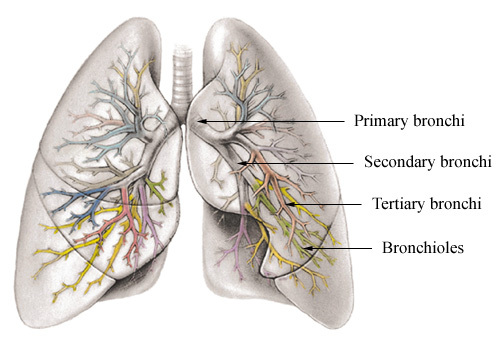 The bronchi are the large airways in the lung more specifically the two major branches from trachea that lead to the lungs. Inflammation of the bronchial tubes due to infection or allergy destroys the smooth muscles; the bronchial tubes lose their elasticity and prevents secretions to be cleared. Due to inflammation and smooth muscles damage anatomical changes occur as a result, and cause the airways walls to be irregularly shaped. Secretions are then trapped in the airways causing bacterial growth. This increases the risk of infection to spread into the lungs airways causing pneumonia. Congenital bronchiectasis may occur due to genetic defect such as in cystic fibrosis, Kartagener syndrome, Alpha-1-antitrypsin deficiency or Young's syndrome. A defect in the airway cilia of the embryo can cause bronchiectasis. Acquired bronchiectasis – can appear with recurrent infections, long term inhalation of toxic fumes, aspiration of foreign bodies in the respiratory tract, alcohol or drug abuse and tuberculosis. Multiple and poor treated pediatric lung infections can lead to lung destruction and bronchiectasis later in life. Prevention is a very important factor, including proper treatment, avoidance of secondhand smoke and toxic fumes. the best avenues in maintaining good hygiene and preventing respiratory problems. The salt aerosol helps to fluidize the mucus and clear the airway passages. It also helps to reduce inflammation and kill bacteria in the airways, preventing and stopping infections. Bronchiectasis is characterized by an increased production and accumulation of mucus, numerous infections and shortness of breath and fatigue due to poor lung functions. Wheezing may or may not be present. Sputum can sometimes be bloody due to damage of the bronchial walls or yellow, green with bacterial infection. 2. Saccular bronchiectasis – more severe than the first and is characterized by more damage and distortion of the airway walls and more mucus stagnant mucus and sputum. 3. Cystic bronchiectasis – is the most severe form but least common todays. It can appear in untreated lung infections, usually before the antibiotics were discovered, and where the person survives but with a permanent lung damage. There is productive chronic cough and lots of mucus production.